While açaí fruit has been a staple in the diet of Brazil’s rainforest communities for generations, the small purple berry has only recently taken off in the freezers of supermarkets and juice bars in the United States and other major importing countries around the world. Recognized as a “superfood” for its high concentration of antioxidants, açaí fruit has become the latest health trend in the United States—and the United States’ most trendy import from Brazil(1). In fact, the fruit is imported for use not only as a food, but in products ranging from cosmetics and dyes to industrial oils around the world(2). Açaí fruit are small purple berries harvested from açaí palms in the Amazon rainforest. While the berries may be small, their potential for saving the Amazon rainforest is huge(4). As a non-timber forest product, açaí is marketed as a sustainable product that creates value for both local rainforest communities and the forest itself(4). Indeed, açaí exports can be a strategy to prevent further deforestation of the Amazon by way of clearing for cattle and soya production. In fact, açaí pulp contributes more than U.S. $2 billion to Brazil’s economy each year—second only to beef and timber. Locally, açaí producers can make more than $1,000 per hectare in annual profit—far more than they profit from soya and cattle(2). However, intensified production of açaí can degrade its existence as a sustainable non-timber forest product. 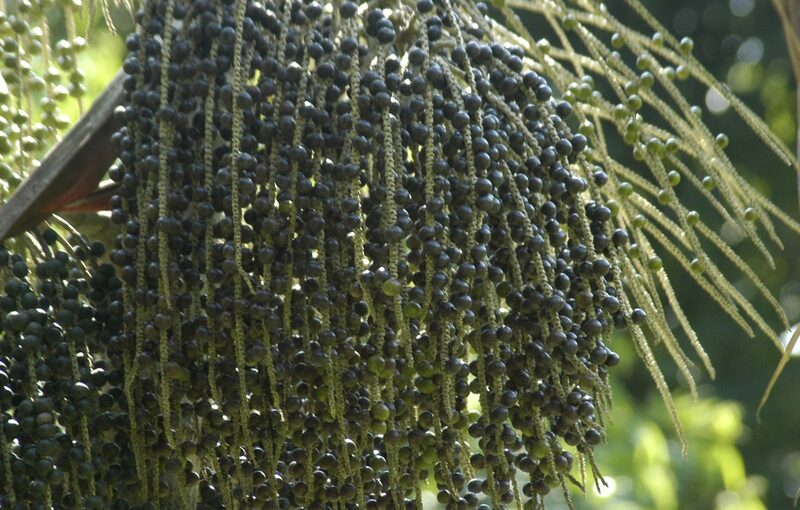 While açaí palms grow naturally throughout the Amazon, increased demand from the United States has resulted in the conversion of native floodplain forests into açaí-dominated forests that closely resemble plantations for intensified production. Additionally, vegetation around açaí clumps is increasingly being cleared to encourage açaí growth and facilitate fruit collectors to move throughout the forest(3). Therefore, ironically, market growth for açaí as a sustainable forest product may supersede sustainable supply. To counter the negative effects of açaí intensification prompted by increased demand, alternative production must be adopted. One such production alternative lies in a close relative to the açaí palm: the juçara palm. While the açaí palm dominates Brazil’s Amazon rainforest, the juçara palm dominates Brazil’s Atlantic forest, found in the more densely populated southern part of the country. Juçara fruit closely resembles the taste and nutritional properties of açaí and its market potential matches the more popular açaí fruit. However, the pulp of the juçara palm has seen far more limited commercial exposure than açaí. Rather, juçara palms have until recently been exploited strictly for heart of palm (palmito). Palmito extraction requires killing the single-stem plant, and intensive palmito harvesting has placed the juçara plant on the list of species threatened with extinction. Juçara fruit extraction as a substitution for açaí represents a sustainable alternative to palmito production and intensified açaí production in the Amazon. Additionally, juçara fruit production has the potential to create a positive feedback loop of conservation and local development by increasing revenue in Atlantic forest communities(1). Recognizing and promoting non-timber forest products like açaí and juçara fruit creates value for Brazil’s rainforests alive rather than dead—as long as production remains sustainable. Rather than poorly enforced laws and regulations preventing deforestation, it is the social and financial incentives created by market demand for sustainable products that can save the rainforests(4). Nobre, C., Architects of South American Science. Nature, 2014. 510: p. 209-212. Weinstein, S. and S. Moegenburg, Açaí Palm Management in the Amazon Estuary: Course for Conservation or Passage to Plantations? Conservation and Society, 2004. 2(2): p. 315-346. Trevisan, A.C.D., Fantini, A.C., Schmitt-Filho, A.L., and J. Farley, Market for Amazonian Açaí (Euterpe oleraceae) Stimulates Pulp Production from Atlantic Forest Juçara Berries (Euterpe edulis). Agroecology and Sustainable Food Systems, 2015. 39: p. 762-781.